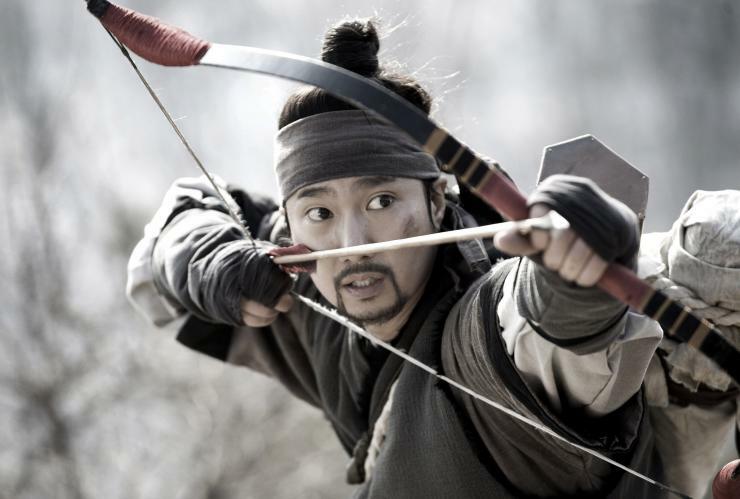 Set in 1636 during the second Manchurian invasion of Korea, Arrow, The Ultimate Weapon (AKA War of the Arrows) (최종병기 활) tells the story of Nam-e (Park Hae-il (박해일) and his sister Ja-in (Moon Chae-won (문채원). Forced to watch their minister father’s brutal assassination, the young Nam-e and Ja-in flee to a neighbouring settlement with their father’s prize weapon – a bow and set of arrows – as their only asset. As they become adults, both brother and sister are hardened to life, but Nam-e’s bitterness leads to the rejection of others. Ja-in on the other hand wishes to live a regular lifestyle, including marrying her sweetheart Seo-goon (Kim Moo-yeol (김무열). On the day Ja-in and Seo-goon are to be wed, the settlement is attacked by a Manchurian battalion led by fearsome warrior Jyu Sinta (Ryoo Seung-ryong (류승룡). They slaughter any who resist and abduct the rest, forcing their captives to march north out of Korean territory – including Ja-in and Seo-goon. 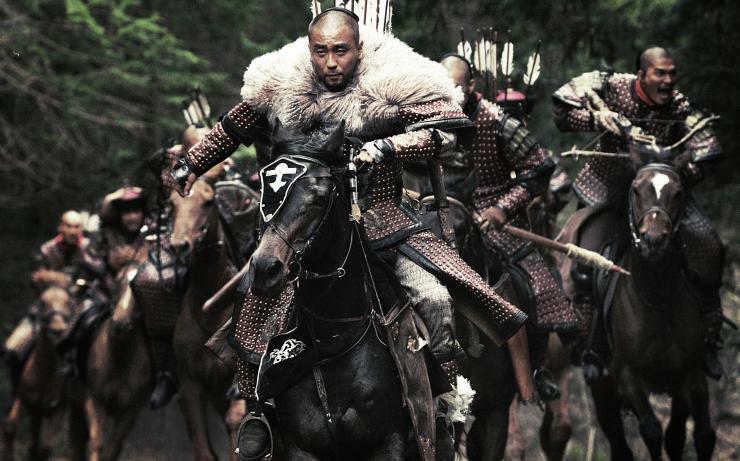 Arrow is perhaps best described as Robin Hood meets Apocalypto (2006), as skilled archer Nam-e races against time to track down and save his sister and friends from the invaders. Screenwriter/director Kim Han-min (김한민) does a great job in establishing the characters through not only their childhood trauma, but also with a keen sense of comedy once in adulthood. The tension is palpable when the Manchurians attack during the wedding ceremony as the couple are ripped apart, villagers are butchered, babies are thrown down wells, and idyllic lifestyles are shattered. The first encounter between Nam-e and Jyu Sinta is also incredibly well introduced as the archer organically evolves from an annoyance to a threat. In a film where chasing down the enemy is the focus of the story, Kim Han-min does a masterful job of making each scene as intense and thrilling as possible. The director employs a variety of techniques to this end, using various angles and styles to ramp up the tension to such a degree that the landscape becomes a character itself. As Nam-e comes close to completing his quest, and as the number of enemy soldiers decreases, the director puts a variety of obstacles in their paths that continually keeps the action thrilling and exhilarating. Unbeknownst to Nam-e, the group of abductees are split into two groups. As Nam-e follows the first group, Jyu Sinta’s battalion pursues Nam-e. The first, comprised mostly of males, is sent to a river crossing; the second, consisting mostly of young females, is sent to the Manchurian prince for his pleasure. A strong sense of nationalism arises in Arrow as the captives are tortured and humiliated. At the riverside, friends and allies are murdered for sport by the Manchurian forces. In a final moment of desperation, Seo-goon picks up a sword and fights for his people and proves his years of military service. Joined shortly after by Nam-e, they inspire a rebellion against their captors and destroy the dock, halting the forced immigration. Secondly, Ja-in is selected for the Prince’s pleasure. As he attempts to assault her, Ja-in picks up a sword and fights against her fate, cutting soldiers and the Prince alike. It’s incredibly refreshing to see such a strong female protagonist, as so often women are relegated to the role of ‘pretty-but-poor-and-needs-a-handsome-man.’ While Ja-in still requires saving, her character is established as a powerful woman who will fight to the last to protect her virtue, which by extension also serves as an allegory as the virtue of Korea. Nationalism is also invoked through the constant references to ‘tiger country’ and the presence of tigers as they are Korea’s national animal. Arrow is an incredibly enjoyable action/adventure film that rises above most other examples of the genre thanks to the ingenuity of director Kim Han-min, who offers refreshing takes on generic conventions. The addition of physical comedy also adds extra enjoyment to the viewing experience. However, Arrow doesn’t quite achieve the level of sophistication that premier examples of the genre, such as The Bourne Ultimatum (2007), provide. This is generally due to the fast paced nature of the film where the protagonists must go from A to B, which stifles character development. The cynical reviewer would no doubt call Arrow a ‘commercial’ film, a label that Kim Han-min openly detests, preferring instead ‘popular’ film. The director is correct – it is indeed popular (the highest grossing film of 2011) and fun, and is well worth watching.